Paleoanthropologists are trying to answer a number of questions about human evolution. Why did our earliest ancestors stand up? How did our ancestors provision themselves? Why did some species become extinct until only one species, Homo sapiens, was left? When, where and why did modern humans evolve? What was the role of the Neandertals? While hypotheses have been suggested, new research continues to change and hone the picture of the evolution of humanity. This section of the course is not intended to provide a complete review of paleoanthropological research, but merely to provide an overview of key finds and outline trends in hominin evolution. For more in depth information, please see the "For Further Exploration" at the end of this page. You may want to start with a 15-minute video by Louise Leakey Digging for Humanity and for a little bit of fun, check out The Simpsons take on evolution, both biological and cultural! These are discussed in more detail next. For a long time, paleoanthropologists thought that large brains were the first hallmark of becoming human; however, research in the 20th century showed that bipedalism, or upright walking, was the first morphological trait on the road to humanity. Human bipedalism differs from the bipedalism practiced by other primates in that it is habitual. In other words, it is the primary form of moving around. Other primates practice facultative bipedalism, which is a temporary form of bipedal locomotion, e.g., primates like chimpanzees may walk bipedally while they carry something in their hands. Few other animals are habitual bipeds, e.g., birds and kangaroos. The morphological changes associated with bipedalism take millions of years to evolve. They first appear with the proto-hominin Sahelanthropus tcahdensis, which is dated to 6.0-7.0 million years ago (mya), but are not fully in place until around 4.0 mya. These physical changes continue to refine until we see them as we do today in modern Homo sapiens (Jurmain et al. 2013). You can explore all of the anatomical changes associated with bipedalism in more detail by visiting Step by Step: The Evolution of Bipedalism hosted by the Department of Anthropology at The University of Texas-Austin [optional]. Several hypotheses have been proposed over the last century or so to explain the evolution of hominins. As bipedalism is the first trait on the road to modern humans, these hypotheses focus on the emergence of habitual bipedalism. Many have been refuted as new data is discovered. The first hypothesis was the hunting hypothesis proposed by Charles Darwin. The hunting hypothesis claims that the key to human evolution was the shift from an arboreal life to a terrestrial one. He predicted that the earliest hominins would be found in Africa based on the similarities he saw between humans and African apes. He suggested that bipedalism gave the first hominins an advantage in that it freed up their hands to carry weapons used to hunt animals. Darwin also suggested that larger brains preceded bipedalism as intelligence was needed to make the tools. Now we know that habitual bipedalism predates large brains so Darwin's hypothesis is no longer considered an adequate explanation. With the discovery of new data, other hypotheses have been proposed including the patchy-forest and provisioning. The patchy forest hypothesis suggests that the emerging mosaic environment that began emerging at the end of the Miocene made bipedalism advantageous. The phrase mosaic environment in this case refers to an environment that had patchy forest interspersed with grasslands that eventually became the African savannas that we know today. This caused food resources to become spread out over the landscape. For traveling long distances, bipedalism is more energy efficient than quadrupedalism. Traveling bipedally freed up hands for carrying provisions and the early hominins could have easily fed from both terrestrial and arboreal resources. The provisioning hypothesis states that having hands free to carry food allowed males to provision females and offspring. Since much of the females energy went to child-rearing, the ability of a male to provision her and her offspring would have been an attractive quality. Those males who could walk more efficiently bipedally while carrying food would have been prime mate material, allowing both the male and female to reproduce successfully. The truth of the matter is that the origins of bipedalism are still murky. Further research will hopefully help us come closer to a determination of why bipedalism, and hence our early ancestors, evolved. In the meantime, you can explore other hypotheses on the origins of bipedalism on the NOVA web site: http://www.pbs.org/wgbh/nova/evolution/origins-bipedalism.html [optional]. Apes have a honing chewing complex, which is good for cutting and shredding food. Their upper canines are large, pointed (triangular shape), and projecting. These two teeth also have a sharp edge on the back. This edge is kept sharp because each time the jaws close, the upper canine rubs against, or hones, the sharp edge of the lower third premolar. This can happen because of the diastema present on the jaws that allows for the jaws to close completely. Without the honing action, the canines and premolars would not be able to efficiently shred leaves and fruit. Over time, hominins lose this honing complex. The diastema disappears, the canine reduces in size, and the molars increase in size (Larsen 2014). Loy 2000: 285). However, while there is gradual increase in brain size throughout the australopithecine lineage, it is not until early Homo that there is a significant increase in cranial capacity, approximately a 20% increase over australopithecines. More significantly is the approximately 50% increase in brain size of Homo erectus and the earlier Homo species. It is not just the size of the brain that is important. During this process of encephalization, there is also a rewiring of the brain that coincides with the emergence of material culture such as stone tools. It is not until this occurs that hominins leave Africa, enabled greatly by cultural advances. Non-human primate brains are symmetrical as are the brains of early hominins. With the emergence of Homo we see the lateralization of the brain--it becomes asymmetrial (right brain, left brain). We know this from endocasts. Endocasts form when minerals replace brain matter inside the cranium during the fossilization process. These endocasts allow paleoanthropologists to study the cortical folds of the brain and compare it to modern humans. Based on endocasts, researchers determined that three areas of the brain began to change in Homo: the cerebellum, which handles learned motor activities, the limbic system, which processes motivation, emotion and social communication, and the cerebral cortex, which is responsible for sensory experiences. It is these changes that may have allowed the early members of our genus to develop cultural adaptations to environmental pressures. Why did the brain change in early Homo? So, for large brains to become fixed in the Homo population, the advantages had to outweigh the disadvantages listed above. One possible explanation incorporates the interaction of three different variables: group size, complex subsistence patterns, and the nutritional value of meat (Campbell and Loy 2000: 318). Let's address group size first. Research suggests that brain size and size of social groups correlates positively among living primates, implying that big brains helped individuals keep track of such things as dominance hierarchies, allies, etc. Second, a big brain allows for primates to keep track of large subsistence territories and allows for omnivores to develop strategies for collecting a wide-variety of foodstuffs. Third, eating meat is a relatively easy way to get the nutrition needed to run a big brain, which, as mentioned above, in modern humans takes about 1/3 of our daily metabolic energy. The argument for this, the social brain hypothesis, is laid out by Robin Dunbar in this [psych.colorado.edu/~tito/sp03/7536/Dunbar_1998.pdf article]. Dunbar also claims that it was changes in the neocortex, a 2-4mm thick top layer of the cerebral hemispheres, that were critical in the "homininzation" (development of cognitive abilities) of our ancestors. Please read this short article on the evolution of human cognitive abilities. The Miocene period (roughly 23-5 million years ago) was geologically active in Africa. This is the period of the adaptive radiation of the apes and a period of mountain building that led to the formation of the Great Africa Rift Valley (see Image: Great Africa Rift Valley). 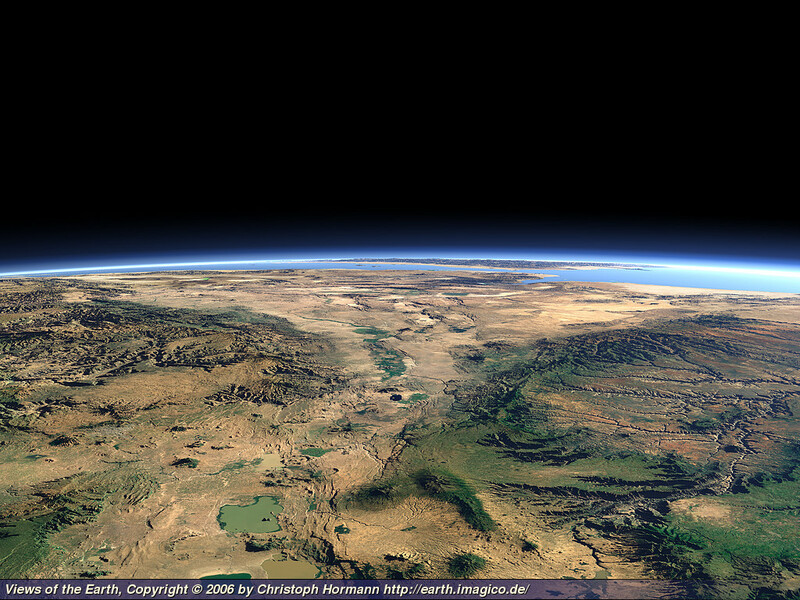 With the emergence of the rift mountains, the rains that heretofore had moved across the continent from the Atlantic Ocean were blocked (referred to as a rain shadow), leading to the aridification of Eastern Africa (Image: African Rift Valley, Kenya and Image: Rift Valley, Afar, Ethiopia). The savanna environment that evolved in Eastern Africa was and is a much more open environment than the forested environment of Western and Central Africa, leading to rise of new adaptations for plants and animals. It is in this newly emerging environment that hominin evolution takes off, although recent research indicates that proto-hominins lived in Western Africa. 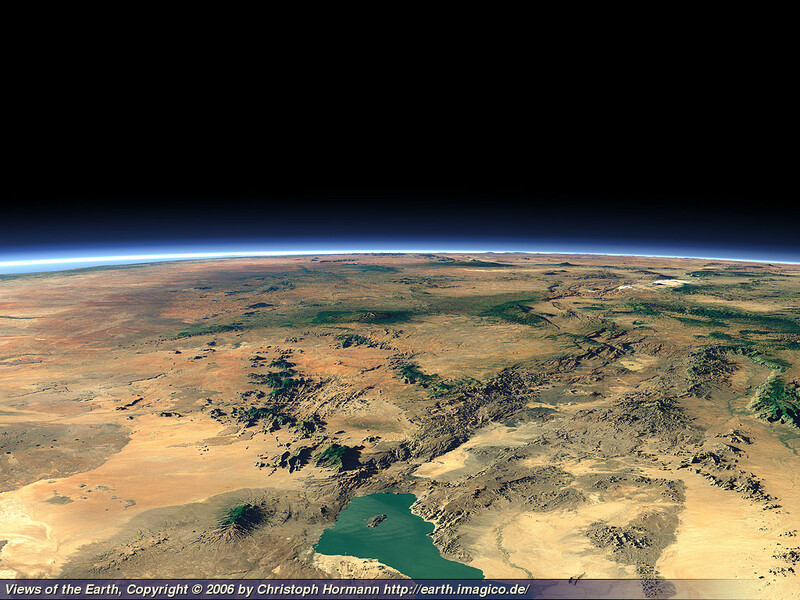 Grasslands spread in Africa between 10-5 million years ago during a cooling and drying phase. It is during this time frame that the common ancestor of African apes and humans lived. The common ancestor was more than like a quadruped who was arboreal or at least spent a significant amount of time in the trees. In the middle of this period, approximately 7-6 million years ago, the first bipedal hominin emerged, Sahelanthropus tchadensis. Sahelanthropus and a few other early hominins are referred to as proto-hominins in recognition of their primitive, ape-like features. In the mid-Pliocene period, 3-2 million years ago, yet another cooling and drying phase is correlated with the adaptive radiation of the hominins, including the emergence of the robust australopithecines (note: some paleoanthropologists place these species in a separate genus, Paranthropus. In this course we will refer to the robust species as Australopithecine) and the genus Homo. Near the beginning of the Pleistocene period, also known as the Ice Age, the environment continued to get drier. Open habitats spread in East Africa. During this period, Homo ergaster (Homo erectus) emerges and finally leaves the African continent. This data has a tendency to make us think that hominin evolution was driven by environmental changes; however, the presence of Sahelanthropus tchadensis in West Africa forces paleoanthropologists to acknowledge the possibility that geologic, climatic, and environmental changes occuring in Africa during the Miocene, Pliocene and Pleistocene had little to do with the evolution of hominins. Boyd, Robert and Joan B. Silk. 2009. How Humans Evolved, 5th edition. New York: W. W. Norton. Campbell, Bernard G. and James D. Loy. 2000. Humankind Emerging, 8th edition. Boston: Allyn & Bacon. Johanson, Donald and Kate Wong. 2010. Lucy's Legacy: The Quest for Human Origins. New York: Harmony Books. Stringer, Chris and Peter Andrew. 2006. The Complete World of Human Evolution. New York: Thames & Hudson. Tattersall, Ian. 2008. The Fossil Trail: How We Know What We Think We Know About Human Evolution. New York: Oxford University Press. Campbell BG. 2000.Humankind Emerging, 8th edition. Needham Heights (MA): Allyn&Bacon. Jurmain R, Kilgore L, Trevathan W. 2013. Essentials of physical anthropology, 9th edition. Belmont (CA): Wadsworth Cengage Learning. Larsen CS. 2014. Our origins: discovering physical anthropology. New York (NY): W. W. Norton & Company, Inc.
Scarre C. 2005.The Human Past: World Prehistory&the Development of Human Societies. London (UK): Thames & Hudson Ltd.